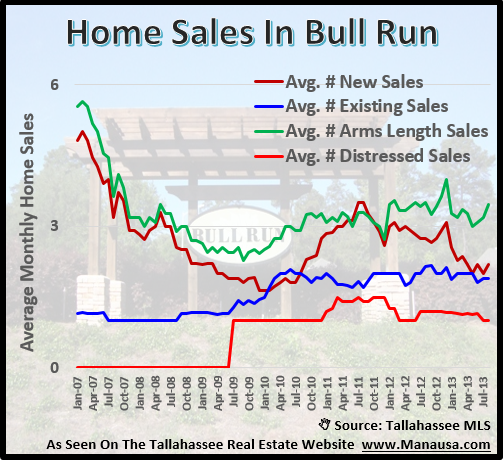 The Bull Run neighborhood is tied for 6th for the number of closed home sales in Tallahassee thus far in 2013. Currently, there are 23 homes for sale in Bull Run, and through August, there have been 32 closed home sales. 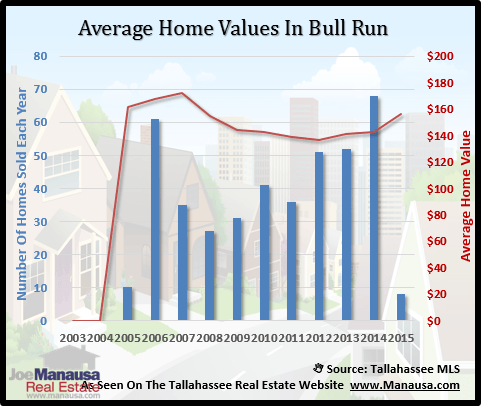 We have graphed some Bull Run home sales trends in order to provide closer scrutiny for this popular NE Tallahassee neighborhood. This first real estate graph shows the number of home sales recorded in Bull Run through August 2013. Note that home sales are recorded twice so that we can track specific types of sales. New home sales versus existing home sales (dark red versus blue) are shown, as are distressed home sales versus arms length home sales (red versus green). One trend that is interesting to note is that new home sales are occurring a little more frequently than existing home sales. I would expect this trend to flip-flop soon, as many Bull Run residents have lived there going on seven years and normal move cycles would project them to enter the real estate market shortly. 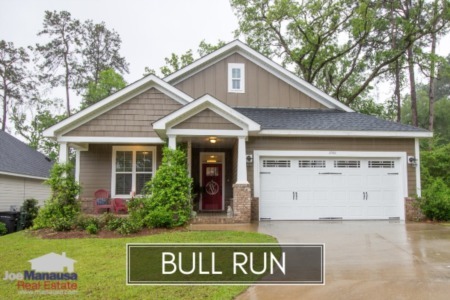 Bull Run home values are rising nicely for all sales types. With only 4 home sales each month, on average, my only concern is that 2 are resales (existing home sales) and one is distressed. That means that roughly 50% of existing home sellers are having to sell as a short sale or foreclosure, and that raises an alarm regarding the continuation of new home construction. The following map shows each of the homes for sale in Bull Run. Simply click on any marker and the full details of the home will be revealed. 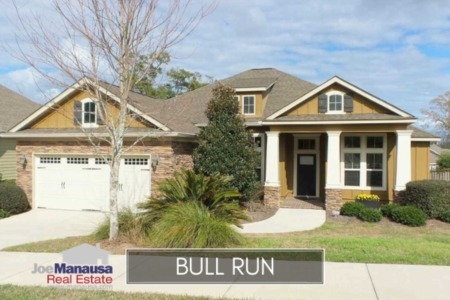 I hope you have gained valuable information regarding home sales in Bull Run, please don't hesitate to drop me a note if you want to more information about selling a home or buying a home in Tallahassee.